Americans are reeling from the alarming disclosure of a massive theft of US government data, linked to Chinese government cyber warriors. China is hardly contrite; plans to honor President Xi Jingping at a White House State dinner this fall will proceed as planned, emboldening China to rattle sabers in the South China Sea and ramp up attacks on the Dalai Lama, who celebrated his 80th birthday on July 6th in Los Angeles. But many US officials in national security and Congress are demanding a reexamination of US–China policy, which should include taking a hard look at how China may be spreading its influence over the Tibet movement. Many American supporters of the Tibetan people’s freedom struggle are concerned about abrupt changes made by the Office of Tibet, which is registered under the Foreign Agents Registration Act (FARA) as the official representative of the Tibetan Government in Exile. The Office of Tibet and the Tibet Fund shared a building in Manhattan from the 1980’s, but in 2014, Mr. Lobsang Sangay, the newly elected Tibetan exile leader, uprooted the Office of Tibet from New York and moved it to Washington. Sangay also replaced the acting head of the Office of Tibet and installed his right-hand man, Kaydor Aukatsang, whose chief qualification is absolute loyalty to Sangay. Sangay and his team wanted to sell the New York building, which had appreciated over the years to over USD 4 million, but met with resistance from the board of the non-profit Tibet Fund. Sangay also found sufficient financial resources to sideline ICT and hire Sconset Strategies, a Washington lobbying firm whose biggest client is Benjamin Wey, the Chinese born multi-millionaire, recently embroiled in a sexual harassment lawsuit in New York City — a Federal Court ordered him to pay USD 18 million in damages — which provided salacious fodder for international tabloids with lurid tales of Wey’s sexual aggression and his proclivity for sending racist-pornographic images in emails. This is not Wey’s first brush with the law: prior to his reputation as the “Horndog of Wall Street” Wey promoted himself as an expert in American-Chinese relations, with a specialty: “how to best invest in China-based American-listed companies.” Wey’s firm, New York Global Group, was investigated in 2012 by the FBI, for its shady practice of purchasing defunct American shell companies to create “backdoor listings” for Chinese companies, who gain a foothold in the US markets and siphon billions of investors dollars (and strengthen the Chinese economy) in the process. In 2005 Mr. Wey agreed to be censured for misleading investors in Oklahoma and failing to disclose information on his firm. When Sangay hired Sconset Strategies in 2011, some questioned that small lobbying firm’s ability to honestly and effectively represent the interests of the Tibetan people, when its top client of long standing is Benjamin Wey, an avowed Chinese nationalist who aggressively pushes the financial interests of the Chinese Communist Party. Sconset Strategies‘ website lists its few other clients, which include Aristeia Capital, a hedge fund owned by the husband of one of Lobsang Sangay’s top supporters. 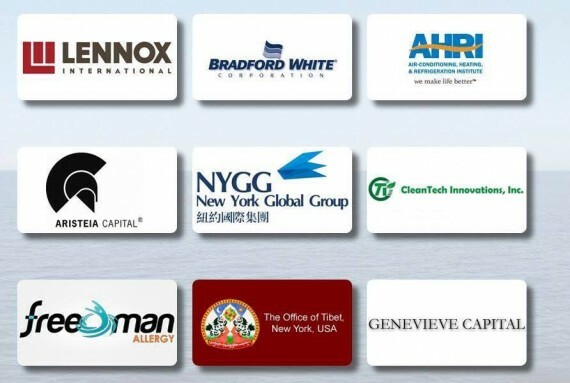 The Office of Tibet’s logo appeared next to Wey’s NY Global Group on Sconset’s website until 2014, when the firm’s relationship with the Office of Tibet was apparently terminated, around the same time the Office of Tibet shifted to Washington DC. Lobsang Sangay has never disclosed any of this information, leading many to ask why has there been so little transparency on lobbying, and why would the Tibetan Government in Exile hire a small lobbying firm that also promotes Chinese interests? Is overlooking this conflict of interest mere incompetence, or signs of something worse? While studying at Harvard Law School, Sangay made a very public alliance with Ms. Hu Xiaojiang, whom intelligence sources identify as a Chinese Ministry of State Security co-optee. Ms. Hu helped arrange Sangay’s 2005 trip to Beijing and Shanghai. Indian intelligence officials have expressed concerns over Sangay’s willingness to declare himself a Chinese “overseas national” while continuing to hold a Tibetan refugee identity card issued by the Indian government. Sangay denied that he made his 2005 trip on Chinese papers until he was confronted with irrefutable evidence in 2011. The Office of Tibet’s FARA statements reveal that they aren’t doing much lobbying, despite having an expensive new property in the nation’s capitol. According to FARA filings from October 2013 to March 2015, the Office of Tibet reported USD 900,000 in income, mostly through donations by Tibetan groups around the U.S. and Canada. The office spent USD 550,000, including USD 75,000 spent on travel, and more than USD 30,000 on “Chinese outreach” and entertainment expenses. Meanwhile, Lobsang Sangay is working the lecture circuit, and turning heads with his pro-Beijing statements. In a May 2013 speech at the Council on Foreign Relations in Washington, Sangay stated that the Tibetan movement had abandoned democracy as a goal, accepted Chinese Communist rule in Tibet, and acceded to China’s full “discretion” in militarizing the Tibetan plateau. Sangay’s disturbing use of Chinese Communist propaganda code-words to describe Tibet can be found in his published papers, in which he refers to pre-1959 Tibet as a “feudal realm” that was “shackled to feudalism,” with “monks and grandees” displaying “reactionary” attitudes. The Office of Tibet now has a USD 1.7 million office around the corner from ICT’s USD 2.7 million townhouse near Dupont Circle, which begs the question: how is a penniless refugee community of 150,000 people scattered across India and Nepal served by all this fancy real estate in Washington? Who is the legitimate representative of the Tibetan people? The next time Lobsang Sangay heads to Capitol Hill, let’s hope someone pulls up his bio and asks this ambitious Tibetan politician what drives his rejection of democracy and embrace of Communist Chinese rule, how he explains being in bed with Benjamin Wey, and who paid for his mortgage and his spanking new Washington office.